It was my most thrilling adventure yet! My old friend Professor von Volt had discovered the location of the famous Ruby of Fire. And before I could let out a squeak of protest, my sister Thea had dragged me into race to be the first to find the legendary gem. The jewel was protected by thousands of ancient booby-traps -- a 'fraidy mouse's worst nightmare? Would I make it through with my fur? 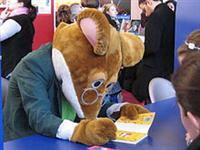 A best-selling author, Geronimo Stilton works as a journalist and editor for the newspaper The Rodent's Gazette. He has a younger sister named Thea Stilton, a cousin named Trap Stilton, and a favorite little nephew, nine-year-old Benjamin Stilton. Geronimo is a nervous, mild-mannered mouse who would like nothing better than to live a quiet life, but he keeps getting involved in far-away adventures with Thea, Trap, and Benjamin, and sometimes Aunt Sweetfur.